Get ready to take control of your results. The DEXA is considered the gold standard measure of body composition. The scan takes roughly 10 minutes to complete, is non-invasive, and provides the most accurate measure of any testing tool. The DEXA is able to measure areas of fat that aren't accessible with other testing methods and doesn’t have to estimate any region of body resulting in a more accurate measure of body fat percentage. 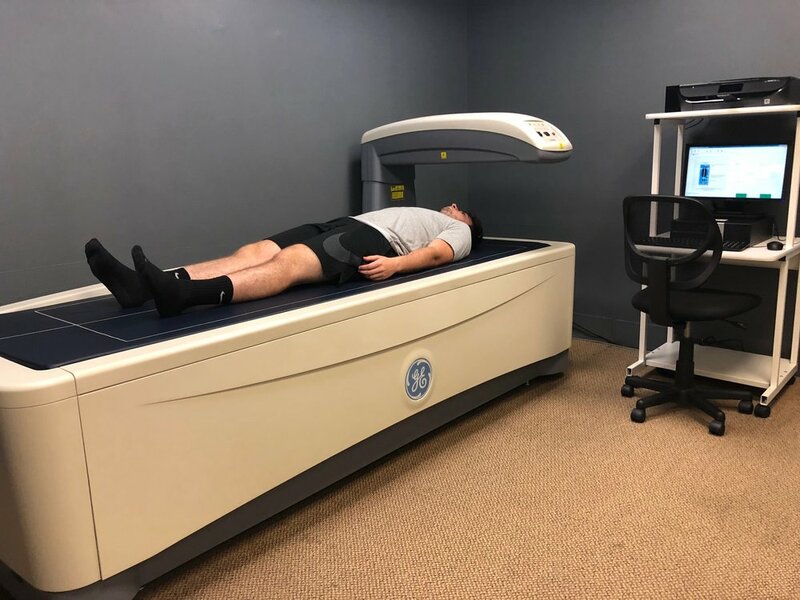 A DEXA provides a detailed breakdown of fat, lean, and bone mineral content in your body, and the DEXA is able to divide the body down into different regions (arms, legs, trunk) and provides a composition makeup for each region. The segmented breakdown can highlight muscular imbalances and validate composition driven programs that focus on fat-loss or muscle gain. The results of a DEXA scan can provide useful insight to how your workout & nutrition plans have impacted your composition. The data can be used to validate programs, provide info to drive changes, and track overall progress. Using the DEXA and tracking your workouts & nutrition provides feedback to create a program that is proven to work for you. Who Is The DEXA For? Are you starting a new program, adjusting your nutrition, or a physique competitor looking to improve your workouts or learn how your fitness & nutrition program is impacting your body? Don’t simply make a change and hope that it works - regular DEXA scans can help you discover what works best for you no matter your goal. The accurate and measurable data from a DEXA can show you how the variables you have changed have impacted your body over time. Want to Prove Your Programs Work? Clients want results and the DEXA gives you the data to prove that your workouts are getting the job done. The scale and girth measurements are outdated tools that don't paint an accurate picture of client success. The DEXA is a better tool to make sure clients are not simply focusing on losing weight, but instead losing fat and gaining lean muscle. Along with validating programs, the DEXA can help make educated changes, and track progress in multiple areas. Designed to establish baseline data or gather information for a specific purpose. Designed to be a Before & After Scan. Perfect for someone looking to see how a new workout or nutrition program impacts their body. Designed to track progress over an extended period time. Perfect for someone trying to make a long-term, sustainable change and develop a plan that produces consistent results. A resting metabolic rate measurement can give you the precise caloric prescription for fat loss, muscle gain or maintenance based on your body’s unique metabolic rate. Thank you! Someone from the Bodymass Team will respond shortly to get you scheduled!